Saloca in Wonderland: Beating the Winter Blues! I got up this morning and it was dark. I left for work, it was still pretty dark, and cold, so cold I could feel it in the middle of my bones. I left work, it was already pitch black and the street lights glared down at me, bouncing off the puddles - did I mention it was raining too? And still cold. Tomorrow I get to do it all over again. Winter is awesome, isn’t it? I mean it can be pretty and everything, with the frost and the snow, the bare branches, the twinkling Christmas lights and festive window displays. With a hot chocolate in one hand and Christmas shopping in the other, it’s the most magical time of year. Then again, it’s not. It’s dark, it’s cold, it’s wet, and I don’t think I’ll feel my toes again until at least February. There’s pressure coming from every angle, be it gift buying, those awkward but obligatory Christmas get togethers, fitting into that little black dress for the Christmas party, the list goes on and on! But let’s not dwell, on that, that’s the opposite of what this post is suppose to be about! It’s so important to look after yourself during the winter, mind, body and soul, keeping everything upbeat and positive to power through until Spring returns. Here’s a few quick winter survival tips to see you through until the snow melts! It’s been proven that if you get yourself moving, be it at the gym, or getting off the bus a stop early, getting your blood pumping and heart racing releases endorphins that naturally produce ‘happy chemicals’ in the body, leaving you feeling invigorated and rejuvenated. So start that new years fitness resolution early and get up on your feet and give me 20 star jumps - go, go GO! Once you’ve worked up a sweat, run yourself a bubble bath and get your pamper on. There’s something wonderful about a winter pamper, maybe it’s because you can kick the bath up a notch, or you’ve found a whole host of luxury pamper goodies under the Christmas tree, but a winter pamper just wraps you up in warmth and comfort. Light a candle, layer up a face mask, put on some music and unwind. So, you’ve had a work out, you’ve had a long hot bath, next, comes the cosy up. Get your backside into the fluffiest pjs or onesie you can find and wrap a throw around your shoulders, brew yourself a strong tea, light more candles and cosy up on the couch. Treat yourself to something sweet or order in a take away. Catch up on YouTube vlogmas videos, finally watch Orange is the new Black on Netflix, or read some sickly sweet Christmas literature. And if there’s a loved ones arms you can wrap around you, that’ll do too! 4. Take up something new! Most of us are less inclined to take more steps than necessary outside this time of year, and cabin fever doesn’t take too long to set in - so keep it at bay with a new hobby. Bake festive cookies for work, learn to knit, or practice your french braid and winged eyeliner. Make all this extra time you’re spending indoors productive. How about starting some of those January resolutions a few weeks early? Don’t just hibernate, do something with those long winter nights! 5. Brighten up your surroundings! It’s been scientifically proven that certain colours, such as orange can actually boost your mood, so as much as we love our navys and greys, bring a little colour into your winter. Buy some brightly coloured flowers and put them in the room you spend the most time in, or go against the grain and paint your nails with out of season neon. You could even go all out for a multi-coloured themed Christmas tree. Cook colourful food, filled with brightly coloured veggies, like peppers, or whip up some cakes topped with colourful frosting and sprinkles. Inject a little more colour into your life this winter. Now’s the time to start working your way through all of those Sky+ recordings you’ve been storing up, or grabbing yourself a 30 days free Netflix trial and finally watching 24 and House (yup, there’s my winter sorted!). Come Spring you’ll be back in the great outdoors and you won’t want to sit in-front of the TV! 7. Indulge in the season! Make the most of the season by doing things you can only do at this time of year. Christmas markets, Rotary club parades, eyeballing creative shop window displays and driving around the nearby streets looking at everyones Christmas lights. Go see your local shopping centre turn on their lights or grab yourself tickets to a pantomime - you’re never too old to shout out ‘it’s behind you!’. Grab friends, grab family, don a few extra layers, warm yourselves with mulled wine and crepes and embrace the season! Being indoors might seem more appealing, but there’s still adventures to be had outdoors! 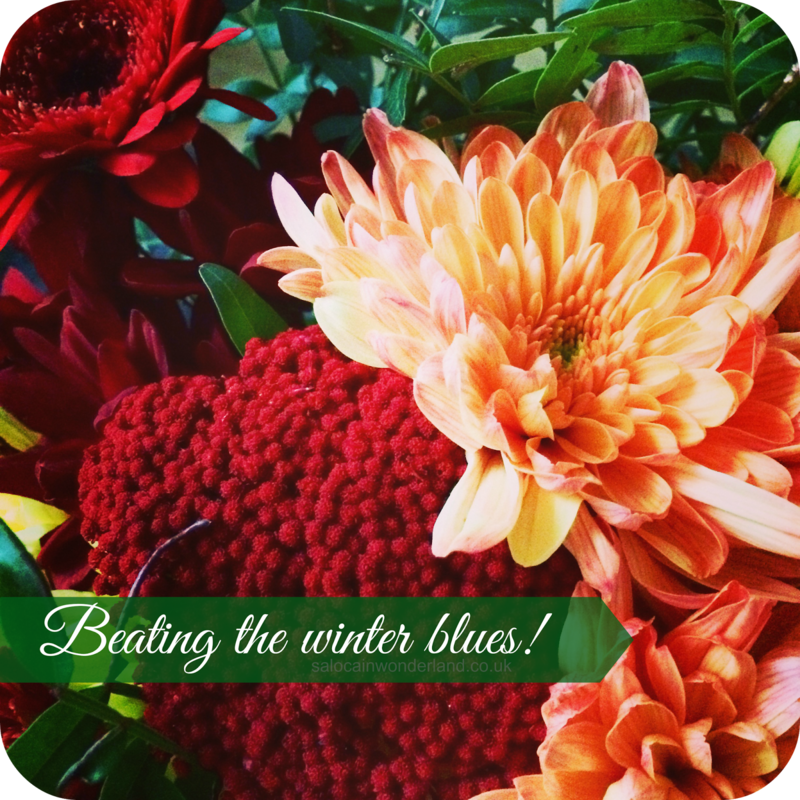 How to you beat the blues during winter? Let me know in the comments below! I like the idea of a pamper session - yes please! Haha. Great tips! Can't beat a good pamper! Never fails to improve my mood 110%!